(September 8, 2018) - The York Revolution erased a five-run deficit to secure their sixth consecutive victory, downing the Somerset Patriots 10-8 on Saturday night at TD Bank Ballpark. Down 7-2 after five innings, the comeback begin in earnest in the sixth as the Revs answered a three-run inning by the Patriots with a three-run outburst of their own. Melky Mesa led things off with a double to deep left-center, moved to third on a line out to center by Telvin Nash, and scored on Isaias Tejeda's RBI single up the middle. Ryan Dent later added a two-out, two-run double to left-center, bringing the Revs within 7-5. Mesa launched a home run to left-center, his 20th of the year, in the top of the seventh to bring York within 7-6. Welington Dotel singled to right with one out in the eighth, moved to second on a wild pitch, and scored as Jared Mitchell roped a game-tying RBI single to right-center, deadlocking things at 7-7. Justin Pacchioli sprayed a two-out RBI single to shallow right in the bottom of the eighth to give the Patriots their final lead of the night at 8-7. The Revs answered one last time with three runs in the ninth to secure the wild victory. Alonzo Harris led off with an infield single and Alexi Casilla reached on a bunt base hit. Mesa flied out to deep center, advancing Harris to third. Nash cashed in with an RBI double to deep right, tying the game as the Revs scored for the sixth consecutive inning. A wild pitch brought home Casilla with the go-ahead run, and Dotel provided the insurance with an RBI infield single. Dustin Richardson made quick work of the Patriots with a 1-2-3 ninth inning for his fourth save. James Pugliese (4-1) earned the win despite seeing a 12-outing scoreless streak ended in the eighth. 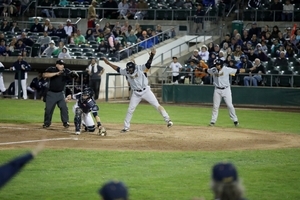 Somerset built an early lead as Alfredo Rodriguez lined a two-run homer to left in the bottom of the first and Ramon Flores ripped a two-run double to right field in the third. Down 4-0, Nash got the Revs on the board with an RBI double to right-center in the fourth, and a throwing error by right fielder Justin Trapp brought home Dent to make it 4-2 in the fifth. Somerset seemingly cemented control with a three-run fifth on an RBI single by Endy Chavez and another two-run knock from Flores, but it only set up the Revs' biggest comeback victory of the season. Notes: The comeback win is the Revs' biggest since a five-run comeback on August 17, 2017 at Sugar Land. The six-game winning streak is the Revs' longest since a six-gamer last September. Mesa (3-for-4) took over the league lead in batting at .339, looking to become the second player in Revs history to win the batting title (Justin Greene, 2014). York starter Mitch Atkins struck out four, increasing his season total to 131 strikeouts, second most in a season in Revs history and eight shy of matching the club record set by Chris Cody in 2013. York has won nine of its last ten and 13 of its last 15. Revs lefty Robert Carson (10-6, 3.51) faces Somerset southpaw Duane Below (8-6, 4.07) on Sunday at 1:05 p.m. Revs fans can catch the action live on SportsRadio 1350, woyk1350.com, The New WOYK app, and WOYK 1350 on YouTube beginning at 12:45 p.m. with Darrell Henry on the call.